Performance Lawn and Landscape - Why Choose Performance? Our mission statement is simple - "Our goal is to enhance the quality of life for our clients and our team members through creating outdoor living spaces with the utmost craftsmanship, honesty, integrity, and satisfaction in our trade. We treat our clients like family, and their properties as if they were our own.". With this as our guide, we work diligently to create outdoor spaces for your family that will bring a lifetime of enjoyment. As a small family business, quality and value are two of the most important things we strive to leave behind on all of our projects big and small. All of our projects are personally overseen by the owner, making sure we are on track every step of the way. We seek to attend many industry trade shows and events in our off-season to stay educated with the most current installation techniques, equipment, and products. "That's how we always did it" is now a thing of the past, as new materials and methods to create stronger more successful projects are coming to the market each and every year. We firmly believe in using the right tool for the job. Because we strive to be the best in our field, we have invested in many specialty tools to complete your project to a higher standard in less time, giving you more time to enjoy the outdoor space of your dreams. We own all of the equipment required to complete most projects from start to finish, greatly reducing the need for costly subcontractors, rentals, and scheduling issues. 1. Testing/ Classifying Base Soils - determining the soil type -sandy, clay, or loamy - is critical for ensuring proper base depth, drainage requirements, and the required modifications to those soils to allow them to support the project for years to come. After we know what type of soils are present we begin excavation - proper excavation methods and equipment are important for efficiency and quality of the job. The grades that are set at this stage are important to the drainage of the base and the stability of the subsoil. Soil modifications required from step one are completed at this time. 2. 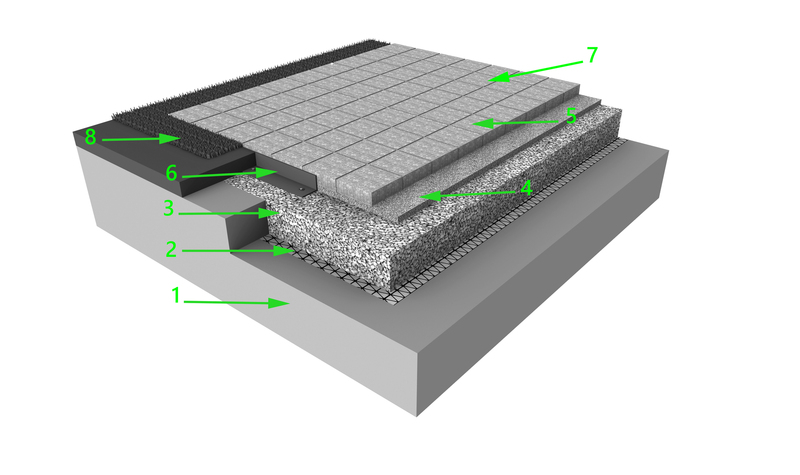 Geotextile/ Grid Layer - The first step for a successful base is the use of a stabilization fabric or grid. The purpose of this layer is to keep separate the base gravels and subsoil, as well as to help spread the weight of the patio across the subsoil. 3. Installation of Base Gravel - Our paver and retaining wall bases are constructed using 3/4" crushed clear stone, compacted in proper "lifts" to ensure maximum compaction. The use of clear drainage stone for the base provides maximum drainage capabilities, and results in no settling or heaving due to frost. 4. Screeding the setting bed - After the base is properly installed, the setting bed is installed over top. To achieve accurate drainage, our bedding layers are installed using a laser transit ensuring all grades are spot on. We use a 1/4" crushed clear stone for our setting beds, providing maximum drainage, and eliminating washout, anthills, and settling that can happen with sand. Stone dust is NOT an approved material for any hardscape installation and should always be avoided. 5. Paver Installation - The pavers are now installed, working from multiple pallets to provide a proper color blending throughout the job as variations do exist between pallets of the same color. This is where the project really starts coming to life. 6. Edge restraints - After the pavers are laid and cut to the final shape, the edge restraints are installed. A typical installation will use high performance HDPE edging with 10-12" spikes to hold it in place. Other options can be granite or concrete curbing. Proper installation of the edging is critical to keep pavers from separating/shifting during use. 7. Polymeric Sand - After edging is installed the pavers receive the initial compaction to settle them in place. After the first pass with the compactor, polymeric sand is swept into the paver joints and followed by another pass with the compactor to settle the sand and "lock up" the pavers to one another. More polymeric sand is then swept in to top off the joints. A blower cleaning of all stray sand particles and residue is completed, and the sand is finished with a water application to the manufactures specifications to active the sand additives, creating a tight, solid joint. 8. Lawn/ Landscape Repair - The final step in our project is repair/ installation of the surrounding area. This is where necessary grading around the pavers is completed to help divert water if needed. Your newly installed patio or walkway can now be enhanced with plantings and landscape lighting to complete the ultimate outdoor experience.